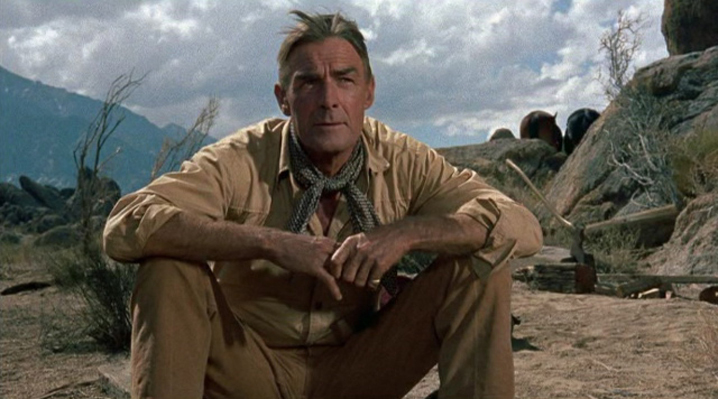 I’ve told you Dear Readers before that Randolph Scott stands behind only John Wayne in my personal pantheon of great Western stars. Scott cut his cowboy teeth in a series of Zane Grey oaters at Paramount during the 1930’s, and rode tall in the saddle throughout the 40’s. 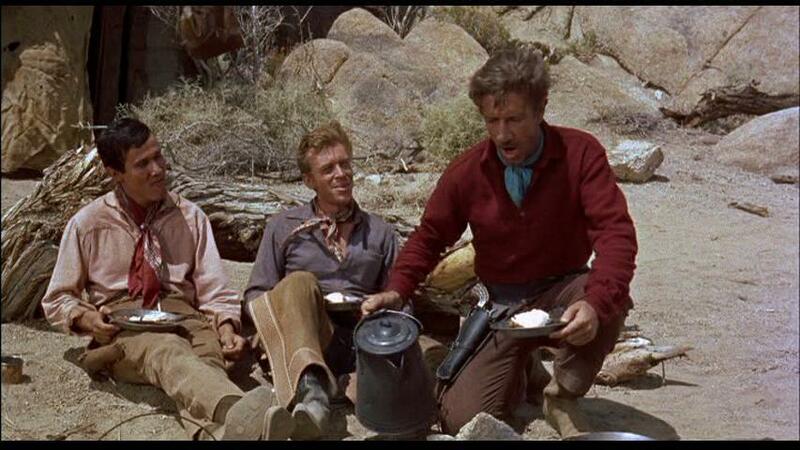 By the mid-50’s, Scott and his producing partner Harry Joe Brown teamed with director Budd Boetticher and writer Burt Kennedy for seven outdoor sagas that were a notch above the average Westerns, beginning with SEVEN MEN FROM NOW. 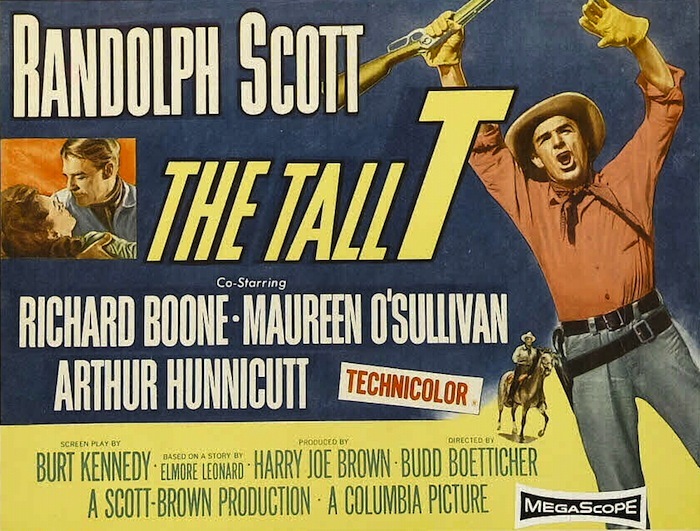 The second of these, THE TALL T, remains the best, featuring an outstanding supporting cast and breathtaking location cinematography by Charles Lang, Jr.
Scott plays Pat Brennen, a friendly sort trying to make a go of his own ranch. Pat, who comically lost his horse to his old boss in a wager over riding a bucking bull, hitches a ride with his pal Rintoon’s oncoming stagecoach. Rintoon’s passengers are newlywed spinster Doretta Mims, whose father owns the richest copper mine in the territory, and her spouse Willard, a worm who obviously married Doretta for her money. The coach pulls into the switching station run by Pat’s friend and his young boy. But neither are to be found… instead three bad hombres greet them, thinking the stage is carrying a payroll they intend to rob. Rintoon is gunned down, and Pat, Doretta, and Willard are doomed to be next, until the spineless Willard strikes a deal with the outlaws to have Doretta’s father pay a ransom…. 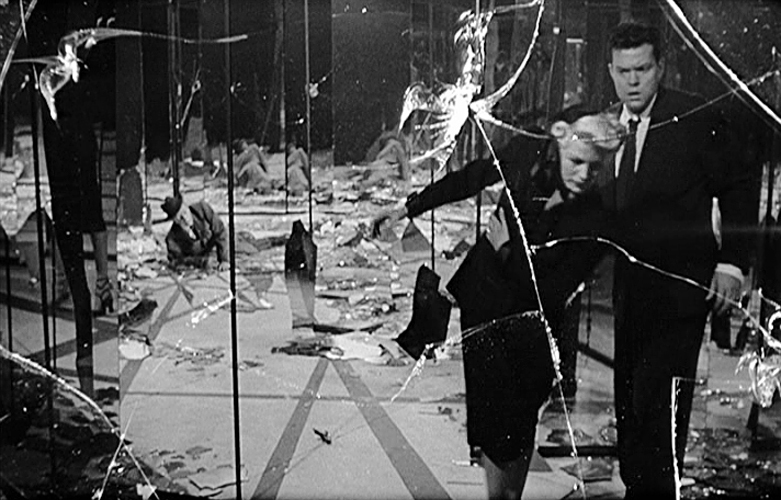 There’s an undeniable theme of loneliness threaded throughout the film, beginning with Scott’s Pat Brennen. Though outwardly an affable man, Pat has a hard edge to him that begins to boil to the surface after he and Doretta are held hostage. He’s always been an independent loner, though more than once people tell him, “Ain’t right for a man to be alone”. Doretta too, not the most attractive woman, suffers from being alone, which is the reason she married the cowardly Willard Mims. Even outlaw leader Frank Usher feels isolated, and finds more of a bond with Pat than his younger, uneducated companeros. Boetticher’s direction emphasizes this loneliness under a vast blanket of blue Western sky and the beautiful but empty scenic location of California’s Pine Valley mountains and desert. The supporting cast is small, again underscoring that feeling of isolation. Maureen O’Sullivan , best known as Jane to Johnny Weismuller’s Tarzan, was semi-retired when she took the role of Doretta Mims. Miss O’Sullivan, a striking beauty, was glammed down for the part of the homely spinster, later blossoming toward film’s end. Richard Boone shows subtle depth of character as gang leader Usher while still conveying a menacing presence as a man not to be trifled with. His underlings are a pair of movie “bad hombres” indeed – Henry Silva and Skip Homeier . Arthur Hunnicut’s Rintoon seems a comic sidekick, which makes his death early on all the more shocking. John Hubbard as the craven Mims, who throws his own wife under the bus to save his miserable hide, elicits no sympathy when he gets what’s coming to him. 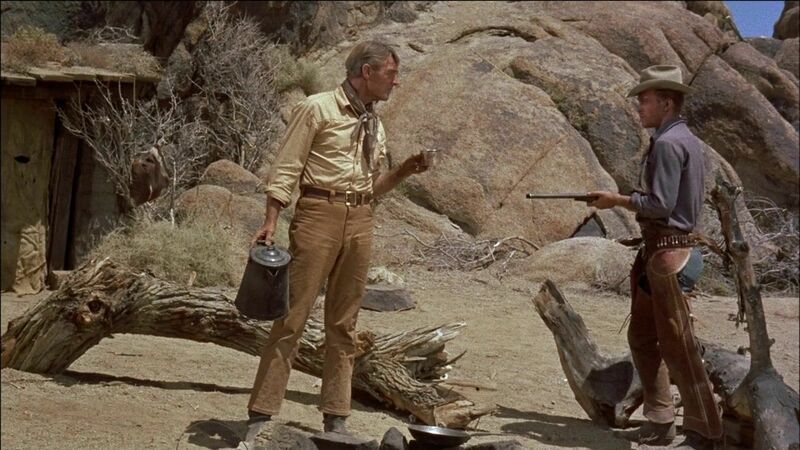 The Scott/Boetticher Westerns don’t have the flamboyance of, say, the Clint Eastwood/Sergio Leone trilogy , or the historical importance of the John Wayne/John Ford collaborations . Instead, they’re all compact, well-made productions that have plenty to say about the human condition under the guise of the Western genre. 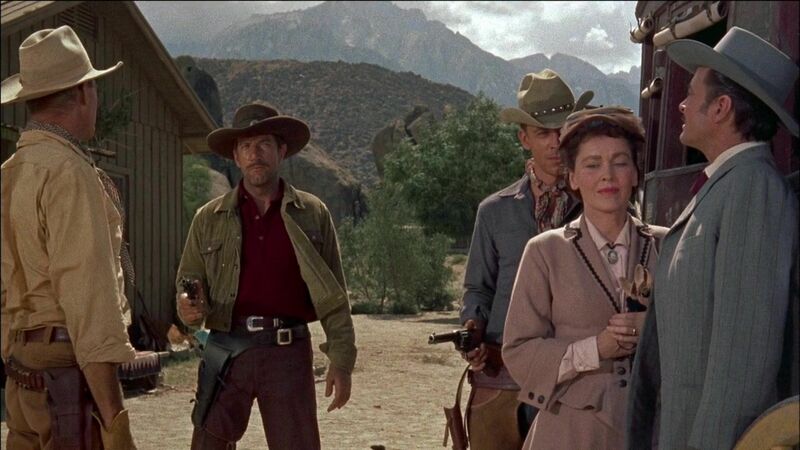 THE TALL T stands tallest among them, and makes a good introduction to those who haven’t seen any of these classic Westerns before. Once you watch, you’ll be hungry for more. Nice review! Just watched this a few days ago myself (from the new Indicator box set) and really enjoyed it. Look forward to your posts on some of the other Scott/Boetticher films. Be on the lookout Thursday & Saturday for more!